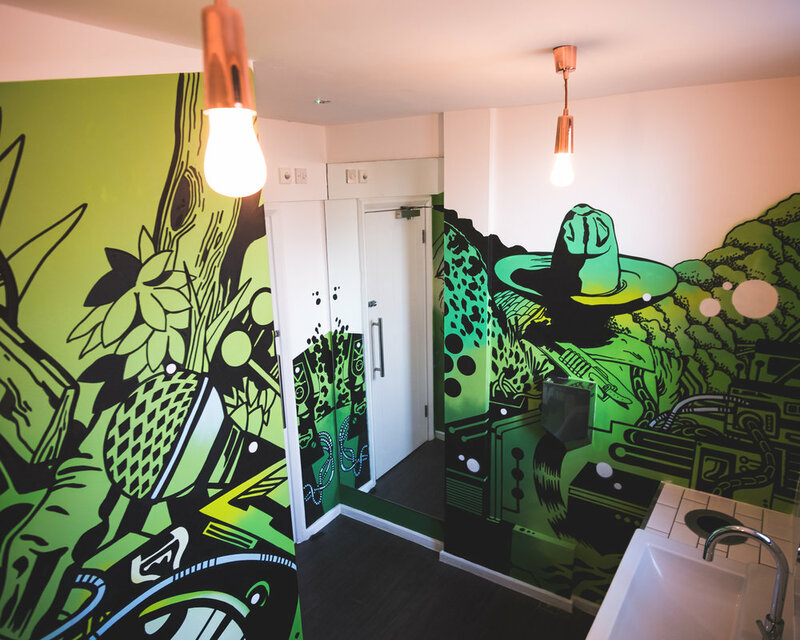 Colorsuper is a Bristol based artist known for bold explorative artworks embodying a series of subjects, characters and storylines. With influences from pop-art, surrealism to anime, Colorsuper's work is produced using an array of mediums from illustration to fine art. Colorsuper's artwork delves into a string of colourful imaginative narratives and characteristic visuals. Portals, distant worlds and original characters are depicted in his distinctively recognisable style. Ironlak was born out of a desire to make quality spray paint more accessible. The end game was simple – more artists, making more art. The new and improved Lak represents the next frontier of graffiti spray paint. 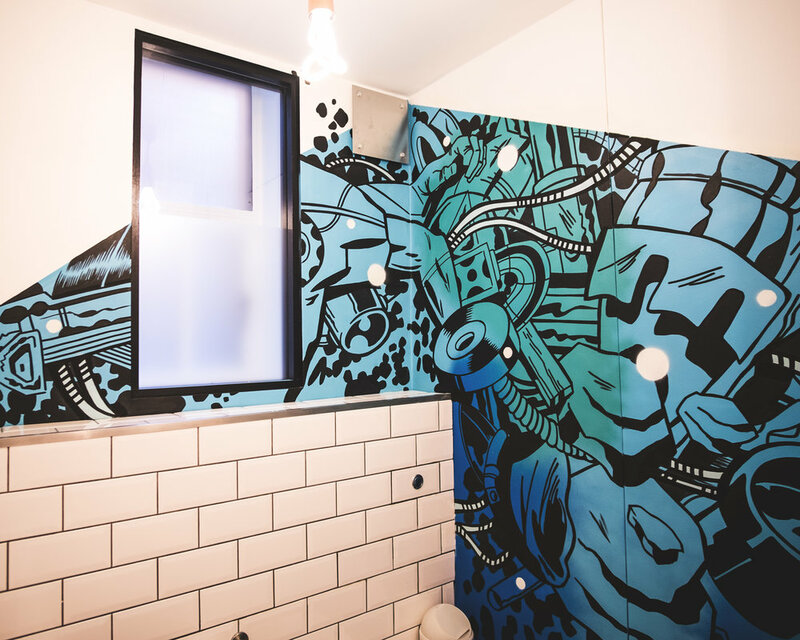 Over the last few years, we’ve incrementally redesigned every aspect of our product – and refined our quality control processes – to deliver you a spray can that is more reliable and an absolute dream to paint with. With upgraded pigments that last. A softer, more versatile valve system. And vibrant colours that offer superior coverage without blocking. You can create your work with confidence. Rediscover Ironlak today and make your mark on society. Our on-going journey to make what’s inside your Ironlak can the best in the biz, is marked with a rebrand and a new look can. 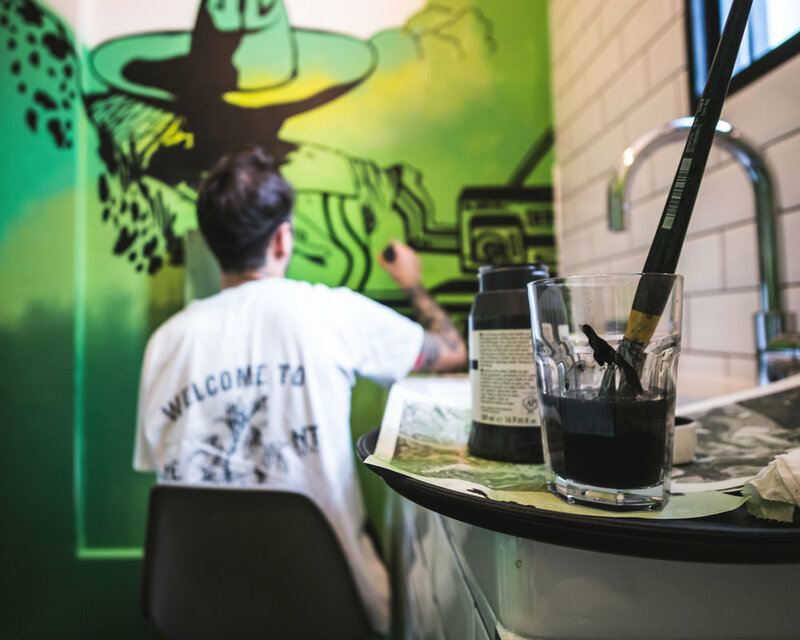 Our in-house design team worked with Matt Haynes at Analogue Digital Agency to modernise the Ironlak logo and can design. From the outset it was important for our design efforts to reflect both the quality of the revised formulation, but also our business attitude towards constant improvement. Therefore, aesthetically the product packaging needed to bring Ironlak into the future, while paying homage to our past, by retaining-yet-evolving the brand conventions and design vocabulary that has formed the visual fabric of the brand since day one. Sometimes keeping it simple, is actually more complicated. In staying true to the existing brand aesthetic, we needed to keep the design simple and bold, building a set of design guidelines around type and colour that could be rolled out onto all of our products. This process was more challenging than it would appear from the outside, with plenty of deliberation and hours of Skype arguments erupting from minute details. You’ll see the true fruits of this labour as a bunch of new products drop over the coming months. For the spray can itself, we took advantage of can production processes, allowing each can to have its own unique handstyle. Our first production run features 12 different handstyles by writers from around the world (CURVE, ASKEW, SOFLES, STRAY, GARY, JURNE, SIRUM, POSE, EWOK, SAUCE, AYRES & MACH) with more to come on a semi-regular basis. To set it all off we used the silver can as a pop colour, added a gloss UV logo at the top, and bottom, and coloured the bottom mounting cup with that Ironlak magenta flavour. Long-term Lak supporters will also notice that we returned to a matt finish on our packaging after several years running gloss. Honestly, it just looks better. To celebrate the launch, we’re introducing 22 new colours to the Ironlak range. We took a magnifying glass to our colour range, identified some gaps and filled them in. Welcome: Tickle, Baked, Tango, Whip, Prince, Frat, Punk, Shaka, Boston, Shamrock, Ogre, Sniper, Kosciuszko, Kirra, Eucalypt, Tweed, Squelch, Marsh, Mustard, Two Cents, Fluoro Red and Fluoro Yellow. Now you’ve got 137 colours to get proactive with. We’re about to go deep on the features and break down what the new Ironlak can do for you. It’s a meaty read, but remember – knowledge is power, so pay close attention. Class is in session. Thick like butter, smooth like margarine. Early on, we established the importance of opacity. Paint that covers well the first time lets you get your work done quickly with fewer coats, on almost any surface. It starts with a high concentration of artist grade pigments, which are ground, a minimum of four times, in a ball mill to create smaller particles. The result: a dense paint formula which has been refined to help paint flow without blocking or compromising coverage. 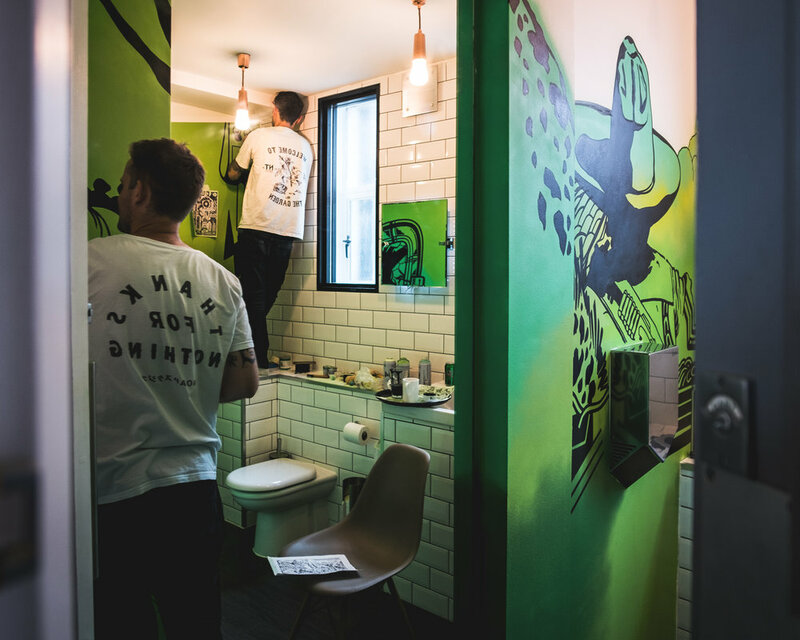 So whether you’re getting busy on timber, concrete, steel or raw brick, you can expect paint to go on thick, with levelling properties that also make for smooth painting of canvas, pottery and plastics. We got you. You got to burn to shine. Shine* so bright they’ll be begging you for eye-relief. From panging purples to blues that go BOOOOONGGG! Bright opaque oranges, or more subtle tones, you have over 100 unique colours to choose from. 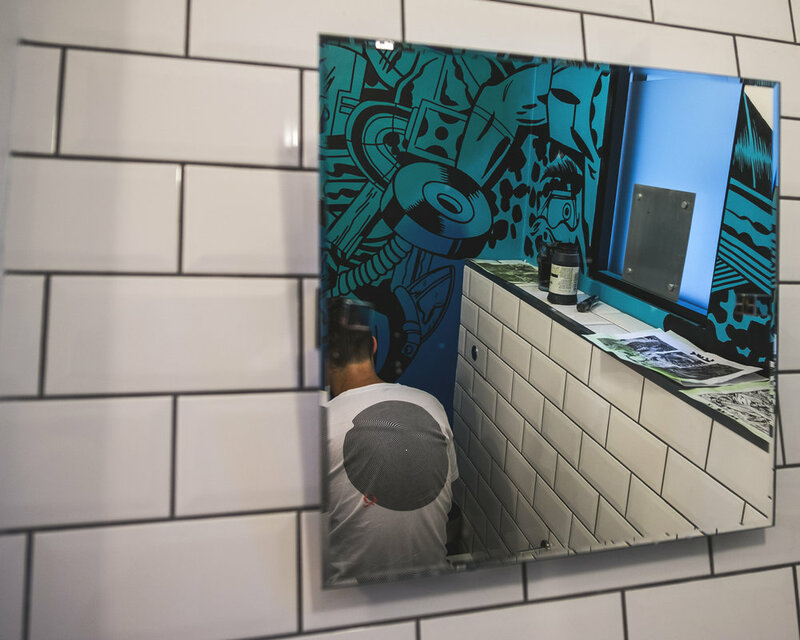 Add a brilliant gloss finish that stays smooth thanks to our resin’s levelling capabilities, and you’ve got a recipe for colour schemes that pop off any surface. With endless colour possibilities, you can create fresh fades, clean patterns, or add depth and contrast to your work to help it stand out. *Sunglasses sold separately. The cleanest lines are only the beginning. Back in 2008, Ironlak became the first artist spray paint in the world to introduce an acrylic resin system. Today, our proprietary resin blend allows you to drop the cleanest line work imaginable. Outlines? They’ll be super crispy. Precise fill effects? Yesssir. Over spray? Not on our watch! And thanks to its better bonding properties, excellent adhesion and flexibility your work will last longer on surfaces that would normally be prone to flaking or peeling. It’s also easy to use, dries fast, helps with colour retention and performs surprisingly well in wet and undesirable weather. Think of it like this; our acrylic resin is your trusty sidekick that shies away from the limelight but has your back when it’s time to floss. When you’re creating artwork in environments as harsh as the Australian summer, you wanna make sure the fruits of your labour hold up against the elements. Ironlak’s current formula boasts high quality artist-grade pigments, similar to those used in the automotive industry. Independent weather simulation tests at a laboratory in Florida and our own real world tests under the brutal Brisbane sun have demonstrated a strong resistance to UV exposure. Couple this with a strong paint film that prevents oxidisation and helps retain lustre, your work will stay alive outdoors for years to come. When you start to spray with the new Ironlak 400mL spray can, your fingers can feel the difference. Our valve’s softer spring provides less resistance on your spritzing finger and combined with a balanced propellant ratio, gives you greater control over paint output. Pop on a skinny cap and half-nozzle it to get ultra-thin lines or create fine details. Press a little harder and you’ve got the perfect pressure for super sharp outlines. Bang on a fat cap and you’ll fill large areas super fast. Hold back a little to create a thinner line, then pump it harder to flare your line out all in one motion. With many different nozzles to choose from, your options are limited only by your imagination, and your can control. Switch it up. It goes deeper than smell. Your health and our environment are worth protecting. But, often you can’t see or smell the impact aerosols have. To build an aerosol paint that is both amazingly capable and safer for you to use is an exercise in balance. The challenge – evaluate the highest quality ingredients and look for ways to reduce volatility, without compromising performance. Our formula does not contain CFCs, toluene, benzene, xylene, lead or any other heavy metals and stacks up against ‘The Industrial Chemicals Act’ in Australia, ‘REACH’ in Europe and ‘ASTM D-4236’ in the USA. That said, any time you’re using aerosol paint, you’d be wise to protect yourself by wearing a good quality mask. When you’re done spraying, spare a thought for the environment and toss your can into the recycling bin. Shake the can vigorously for at least two full minutes once the ball begins to rattle, or three minutes for optimal performance. Remove ring with wings from under the nozzle before trying to spray. Apply on a clean, dry surface free from dirt and dust. For best finish apply three light, even coats. However when time does not permit, the colour will cover perfectly in one thick coat. After use, turn the can upside down and depress the nozzle until only propellant is sprayed from the can thereby clearing the nozzle and valve. Wear a protective mask and gloves during use. We can't always lead a glamorous lifestyle, and it's handy to remind ourselves that we don't really want it like that anyway! 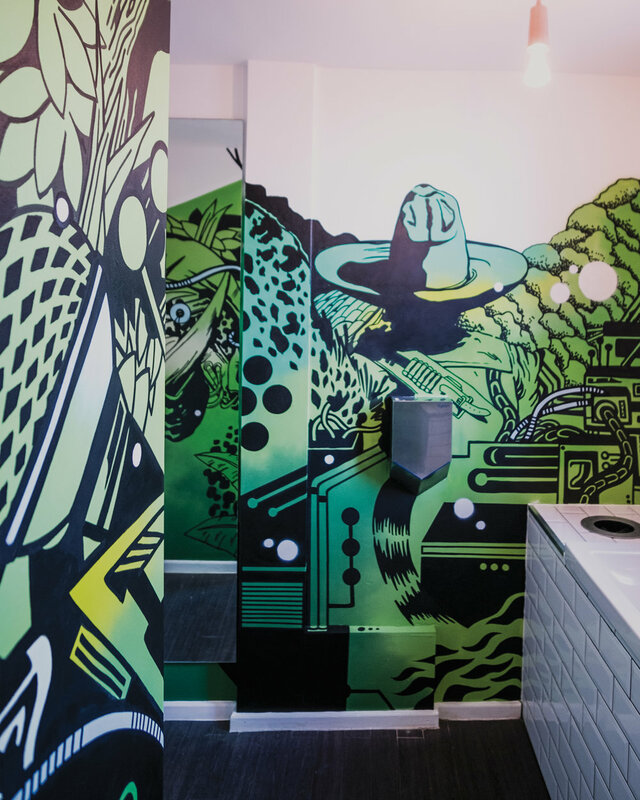 So when the good guys at Jungle studio's invited us to paint some toilets at their lovely studio in Soho, we couldn't say no-no! 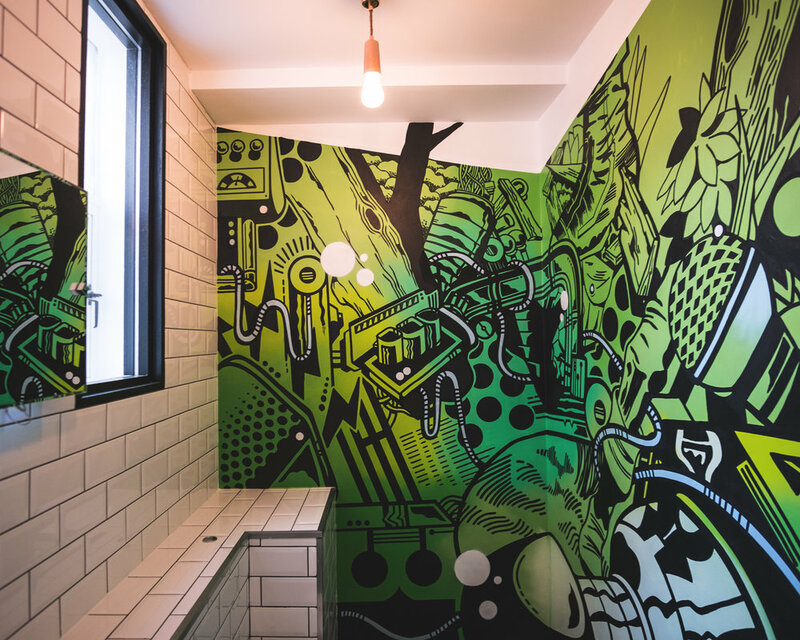 Some really technical angles in these loo's made it challenging for 45RPM and RICHT to paint, plus the added space or lack of it made this little project, interesting. If you're near the gallery, pop in and enjoy some special discounted merch and things. Pop-up store by Not Guilty, will be almost giving it away.